The Person-in-Charge (PIC) in any food establishment will often be the person who has the overall responsibility for running that Location during the entire time of operation. If there are multiple shifts, the PIC will be responsible for the proper functioning of the food establishment’s operation during the work shift. The PIC can be the owner of the business or a designated person, such as a shift leader, chef, kitchen manager or similar individual who is always present in the work site and has direct authority, control or supervision over employees who engage in the storage, preparation, display or service of foods. The PIC is accountable to their employer and the government for making sure that they and the employees on their shift are following established policies and procedures for food safety. When is a PIC required? A designated PIC must be present at all hours of operation. This means that a PIC must be present during all shifts. Is a PIC responsible for food safety in an operation? Food safety is the responsibility of the PIC at any given time, whether that person is the owner or designated person such as the manager, chef or shift leader. However, the license holder is equally responsible for making changes to systems and facilities. What must a PIC know? The PIC must know whatever necessary to ensure food safety as it applies to their operation and responsibilities. PICs need to have the knowledge to ensure safe day-to-day operations, spot potential problems, and to make right decisions on their shift. The PIC should also know the legal requirements for food establishments in Dubai and the ways and means to ensure compliance. How do I become a PIC? Complete a Food Control Department approved Food Safety Certification Course appropriate to the business activity. Successfully pass a Food Control Department approved Food Safety Certification Examination administered jointly by the Department and a DAC Awarding Body under secure conditions. 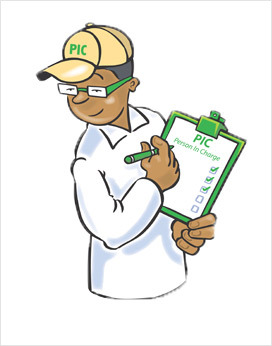 In the event that a newly licensed food establishment opens or an existing food establishment loses its certified food manager, the establishment owner must either hire a new certified PIC or enroll an employee in a training course within 45 days. What are the responsibilities of the PIC? The PIC is a person on duty during all operating hours with authority and responsibility to ensure food safety. The PIC has to perform the following duties to enforce the regulatory policies, procedures, and standards set by the Dubai Municipality. Conduct in-house self-inspections of daily operations on a periodic basis to ensure that food safety policies and procedures are followed. In a large establishment that has separate outlets or multiple departments, such as a hotel or a supermarket, there may be more than one PIC. The duties could change depending on the size and type of business. In larger establishments that have a designated Hygiene Officer, Food Safety Manager or a Quality Assurance Manager, or a Department, the role of the PIC will be limited. It is strongly recommended that the QA Manager or the Food Safety Manager clearly identifies and documents the role of the PIC.